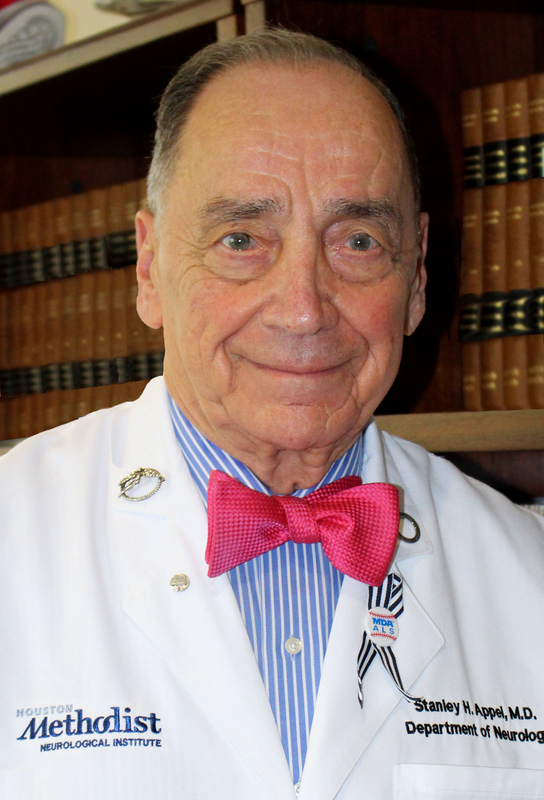 Stanley H. Appel, M.D. is the Co-Director of Houston Methodist Neurological Institute, Chair of the Stanley H. Appel Department of Neurology and the Peggy and Gary Edwards Distinguished Endowed Chair for the Treatment and Research of ALS at the Houston Methodist Hospital in Houston, Texas, and Professor of Neurology at Weill Cornell Medical College. He was previously Chief of the Neurology division and the James B. Duke Professor of Medicine at Duke University Medical Center, North Carolina followed by Chair of the Department of Neurology at Baylor College of Medicine. Dr. Appel is a native of Massachusetts and received his Bachelor Degree at Harvard University and his Medical Degree from Columbia College of Physicians and Surgeons. He is a member of the Board of Directors of the Muscular Dystrophy Association, Chair of the Research Advisory Committee, and a member of the Board of Directors of ALS Therapy Development Institute. He is Director of the MDA/ALSA ALS Research and Clinical Center at Houston Methodist Neurological Institute, and past Director of the National Institute of Aging Alzheimer’s Disease Research Center. Dr. Appel is a member of numerous professional societies and committees, and is the author of 15 published books and over 420 articles on topics such as ALS, neuromuscular disease, Alzheimer disease, and Parkinson’s disease. He has received a number of awards for his accomplishments in Neurology and Biochemistry, including the Gold Medal Award in 1997 from Columbia College of Physicians and Surgeons for “Distinguished Achievements in Medicine”, the Sheila Essey Award in 2003 from the American Academy of Neurology for “outstanding research in Amyotrophic Lateral Sclerosis”, Elected Fellow of the American Association for the Advancement of Science in recognition of the “dedication and commitment to advancing science and serving society” in 2003, Baylor College of Medicine Alumni Association Distinguished Faculty Award in 2004, MDA’s Wings Over Wall Street Diamond Award in 2004, Texas Neurological Society Lifetime Achievement Award in 2005 and the Forbes Norris Award for “compassion and love for humanity in research and treatment in patients with ALS” from the International Alliance of ALS/MND Associations in 2005, and the Museum District Business Alliance Award in recognition of his commitment to research, patient care, and education, 2007, and the recipient of the Houston Academy of Medicine 2008 John P. McGovern Compleat Physician Award. He is also named 2008 Best of the Best Physicians by the Medical Journal Houston. Dr. Appel is internationally renowed as a researcher and neurologist. He has spent more than 40 years devoting his life’s work to diagnosing and treating patients with neurodegenerative diseases, most especially patients with ALS. His greatest legacy, though, may be the more than 200 neurologists he has trained, many of whom have gone on to chair their own departments. In transgenic ALS mice motor neuron death is non-cell autonomous and depends on a well-orchestrated dialogue involving neurons, glia, and T cells. In early stages of motor neuron injury neuroprotective M2 microglia and Treg lymphocytes slow disease progression. As injury accelerates motor neurons release “danger signals” that promote microglial activation to an M1 proinflammatory state, downregulate neuroprotective Tregs, upregulate proinflammatory Th1 lymphocytes, and accelerate disease progression. Removing T cells from the mSOD1 transgenic mouse accelerates disease progression, which can be slowed by transfusions of Tregs that suppress M1 macrophages/microglia and prolong survival. In ALS patients, rapidly progressing patients have increased circulating proinflammatory M1 macrophages, while slowly progressing ALS patients have relatively decreased proinflammatory markers. Treg lymphocytes are decreased in rapidly progressing ALS patients and have lowered FoxP3 expression and suppressive function. The decreased Treg/FoxP3 levels are associated with increased methylation of the FoxP3 TSDR; the greater the FoxP3 methylation the lower the suppressive ability of Tregs. The dysfunctional Tregs regain their ability to suppress Tresp proliferation when expanded ex vivo, and were infused in a pilot study into 3 ALS patients with concomitant subcutaneous interleukin (IL)-2 injections. These infusions were safe and well-tolerated in all 3 subjects during early and later phases of disease. Treg numbers and ex vivo. suppressive functions were increased. Disease progression rates were slowed during the time of infusions and correlated inversely with the improved Treg suppression. This is the first-in-man FDA/IRB-approved phase I study of autologous infusions of expanded Tregs into ALS patients. With the documented safety and potential benefit, further trials in ALS patients appear warranted.